This post was written by Andy Armstrong, VP of Sales & Marketing of HVAC Products at Fujitsu General America, as part of its membership in NEEP’s Allies Program. As homeowners consider ways to “live green”, many may be surprised to learn the powerful effect home heating has on achieving optimal energy and cost efficiency. That’s why homeowners give a warm welcome to innovative energy- and cost-efficient HVAC systems. Home builders reinforce the value of HVAC as a key to living green with a full 87 percent of builders and remodelers considering energy-efficient systems vital to green building, according to a recent National Association of Home Builders report. Selecting the best climate control system is critical, with home heating using more energy and costing more money than any other system in your home—typically making up nearly half your utility bill. So, how do you choose a home heating solution that’s both earth- and finance-friendly? Here are a few helpful hints. While there are a wide variety of home heating systems available, they are not all created equal when it comes to their green living quotient. Forced-air systems and boilers are the most popular, however, others include wood and pellet heaters and active solar heating. Forced-air systems, the most common, depend on a central furnace to provide heat and work by blowing heated air through ducts that deliver warm air to rooms throughout the house via air registers or grilles. They heat quickly and evenly, but many are not energy efficient and some users complain that moving air is noisy and blows allergens around the house. In addition, they require ductwork, which many older homes don’t have. Boilers heat water, and provide either hot water or steam for heating. Steam is distributed through pipes to steam radiators, and hot water can be distributed via baseboard radiators or radiant floor systems, or can heat air through a coil. Steam boilers operate at a higher temperature than hot water boilers, and are inherently less efficient. A lesser-known option, at least among Americans, is called ductless mini-split systems, offered by such companies as Fujitsu General America. 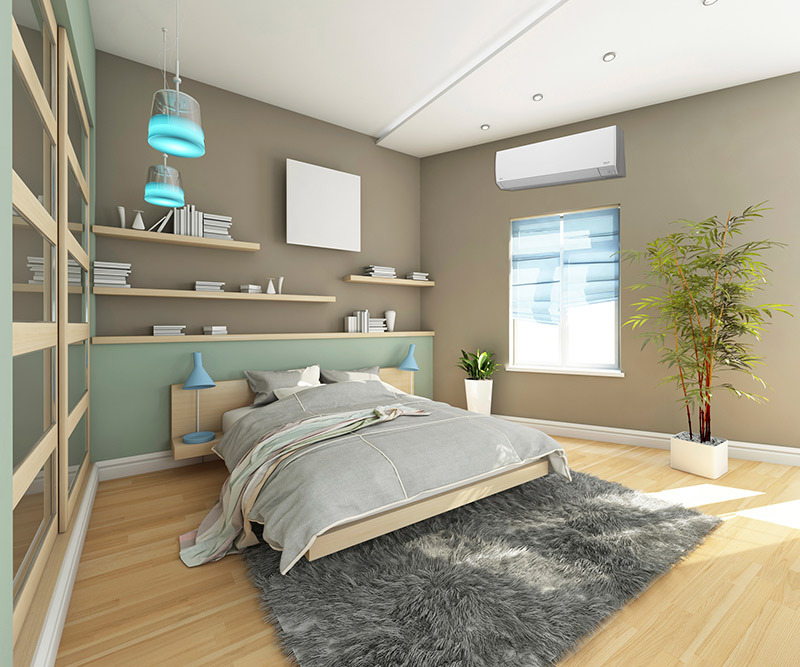 While the majority of HVAC systems in Asia and Europe are already ductless, they are now rapidly gaining traction in North America. Mini-split systems are projected to enjoy an annual growth rate of 14 percent each year through 2020. Ending any “family thermostat wars,” mini-splits feature custom zone control, letting homeowners connect two to eight indoor units to a single outdoor unit. Each zone has its own thermostat so occupants can adjust each room to the temperature they want. Further, only occupied areas are heated, which can represent a significant savings considering the kitchen, dining room, living room, and bedrooms are left unoccupied for at least 40 percent of the time in most households. What’s more, the comfort continues even in extreme cold weather climate. Homeowners can boost the benefits of their energy-efficient heating systems by implementing some simple tips and techniques. Open curtains during the day to naturally heat your home and close them at night to keep the heat inside. Consider air sealing your home and adding insulation to walls and attic to help retain heat. Up to 25 percent of your home’s heat is lost due to small cracks and holes throughout your home. Weatherstrip around doors and windows to keep warm air from escaping and cold drafts from entering. And, make sure your chimney is clean. Lastly, take advantage of the latest “smart” technology. In the case of Fujitsu General’s high efficiency heating and cooling systems, this includes the free FGLair app that controls units from anywhere using a smartphone or tablet. This winter, homeowners can honor both their HVAC budget and their conscience by selecting the most energy- and cost-efficient system to meet their needs. For further facts and to find a contractor nearby, call (888) 888-3424 or visit www.constantcomfort.com or www.fujitsugeneral.com.